There are Brick series, Tip series and Huajuan series. It evolved from Huajuan tea. It is so called because of the patterns on the brick. 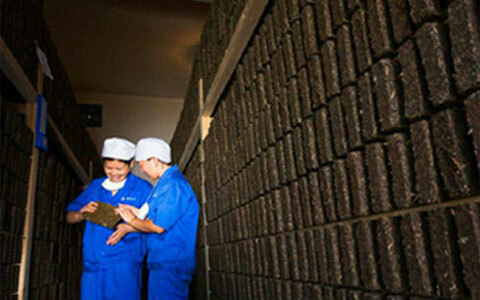 It has the same compressing process with Flower Brick. 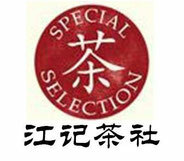 It is so called as this type of tea is produced in dog days which were called “fu” days in Chinese. It used to be produced by hand and now it is produced by machine. 2. 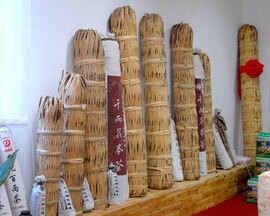 Tip series is also called Xiangjian refined from tip tea leaves and packed in bamboo baskets. 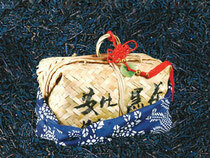 It is refined mainly from the first-grade raw tea and a small quantity of second-grade raw tea. 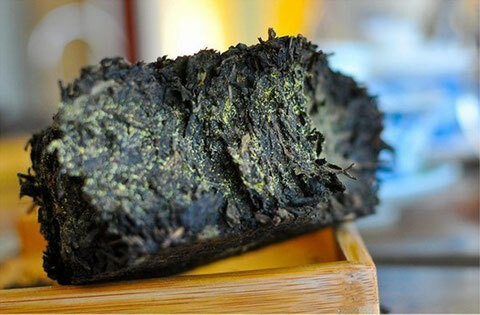 It is refined mainly from the second-grade raw tea and a small quantity of first-grade and third-grade raw tea. It is refined from crude tea which consists of big leaves and tea stalks. It originates from Bailiang tea. Now it contains different types classifies by weight such as Qianliang tea and Shiliang tea which are produced through tramping process. Store in a cool environment and Avoid sunburn. Because sunburn can make tea rapidly oxidize and produce some unpleasant chemicals, such as the sunlight flavor which would stay for a long time. Store in a ventilated place and Avoid airtight places. Because ventilation will help the natural oxidation, help tea absorb the moisture in the air to accelerate the oxidation process and also provide moisture and oxygen for microbial metabolism. Never pack and seal with plastic bags. Some materials with good air permeability such as kraft papers and bast papers are suitable for packing and storage. Store it in an open place. 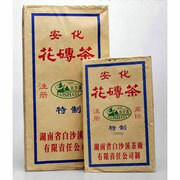 As tea has a very strong absorption, it can not be stored together with other things with unpleasant smell, and should be placed in open and ventilated environment.During the storage, as long as it can keep the standard content of the water and the air humidity is not too high, it will not get mildewed (as the dominant bacteria in brick tea inhibits the generation of other fungus) . However, the tea warm may be occasionally found on the surface layer of bricks which have been stored for a pretty long time. The tea worm is the result of aging and coexists with bacteria. It is proved that drinking tea with tea worms is not harmful to human body.